A new deck definitely looks very alluring but this effect can wear off all too soon if you don’t take proper care of your deck. The secret lies in taking measures to take care of your deck because any wooden surface tends to lose its good qualities when it is exposed to sunlight or to extreme weather for too long. If your wooden deck is un-coated, it will deteriorate fast and unsightly stains will appear. However, if you apply coating onto your wooden deck, the coating can provide some protection to your deck, keeping it from deteriorating and staining. The best way to ensure your woodwork remains protected even before you see deterioration and staining is to act even before the problem occurs. 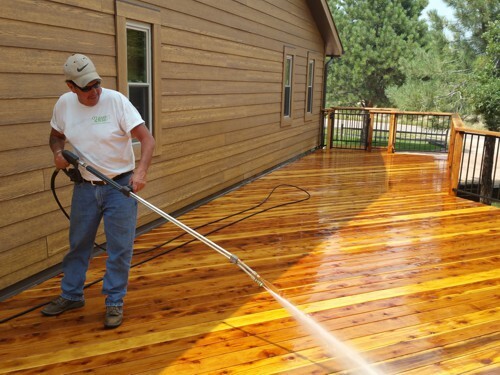 There are many methods available to you here, both mechanical and chemical, to keep your wooden deck attractive and stain-free. For your questions and concerns, call O’Leary and Sons. Their professional services extend from deck building and design, to fence and siding repair. They bring quality services for your outdoor space. Take a look at some ways of actually removing any stains that might already be on your deck. First, you should try to identify the actual causes of your deck surface’s discoloration and attempt to apply the right solution to the problem. Various causes include ingress of foreign matter (such as bird droppings), grease, tree saps, stains from nails and iron articles, tannis or other chemical agents, fungi, algae and fading of wood due to sunlight exposure, moisture and water. Additionally, decomposition of any original coating might be causing some stains. Bleaches are effective at lightening deck stains. Bleaches come in a wide variety. Usually, bleaches are classified into three categories: chlorine, peroxide and oxalic acids. If you know what caused the stain, that information will be very helpful in deciding which type of bleach you should use. Chlorine is a very strong bleach that is capable of removing or lightening just about any stain. Additionally, chlorine also kills off any moss and algae. However, chlorine can damage the wood itself if too strong a concentration is used. Chlorine can also damage the surrounding environment if you’re not careful. A solution of one and a half cups per gallon of water is usually best here. Peroxide bleaches come in two types: A and B and a combination of both of these bleaches should be used for best results. If you use them individually, they won’t work. The combination of the two is very effective at removing pigment stains, but they are not the best at dealing with stains caused by dyes. Oxalic acid is an effective solution for removing stains due to oxidation. For example, a black spot caused by contact with water upon the wood can be dealt with using oxalic acids. Water has iron while wood has tannic acids. When the iron in water comes into contact with the tannic acids in the wood, this results to black spots. We might also see these black spots form around nails or other fasteners as contact with water results in a black ring. Oxalic acid is best for lightening the effects of weather exposure on the wooden deck. Call O’Leary and Sons today to schedule a consultation and get the deck repair paint colorado springs of your dreams!